Wahama freshman Lauren Noble chases after an Eastern player during a run-down in the fourth inning of Tuesday night’s TVC Hocking softball contest in Tuppers Plains, Ohio. TUPPERS PLAINS, Ohio — An offensive eruption. 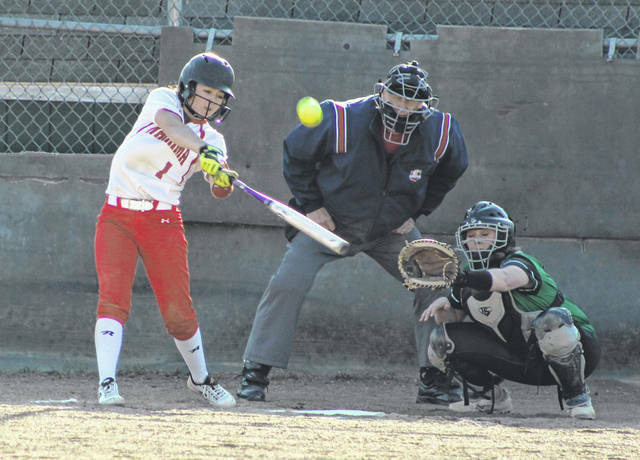 Wahama plated 19 runs over the final four innings of play, allowing the guests to rally back from an early 3-1 deficit while rolling to a 20-10 victory over the Eastern softball team in a Tri-Valley Conference Hocking Division matchup at Don Jackson Field in Meigs County. 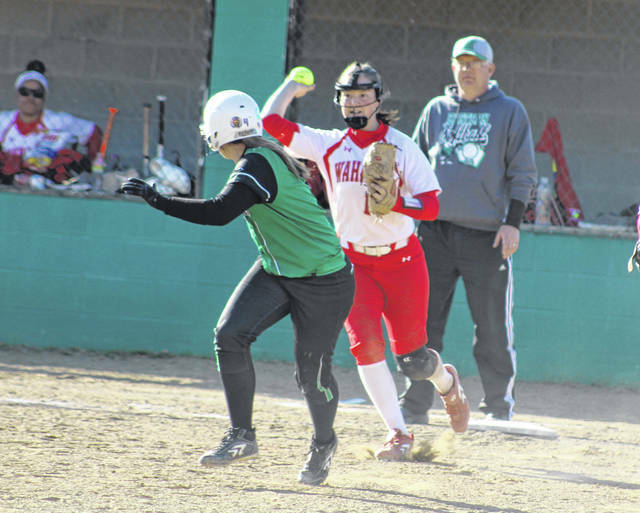 The Lady Falcons (11-1, 6-0 TVC Hocking) were in a 2-0 hole after an inning of play as Kelsey Roberts and Tessa Rockhold provided consecutive RBI singles for the host Lady Eagles (3-3, 3-1). Tanner King homered to lead off the second as the Red and White cut the deficit in half, but EHS countered with a RBI single from Rockhold for a 3-1 advantage through three complete. WHS, however, opened the flood gates in the fourth as Maddy VanMatre led things off with a solo homer, which sparked a seven-run burst that ultimately provided a permanent lead. Deborah Miller singled home Emily VanMatre with the eventual game-winner as the guests managed to build an 8-3 cushion. The Green and White answered with two runs in the home half of the fourth and also scored two in the fifth, but the Lady Falcons got a three-run homer from Hannah Rose in the fifth that extended the score out to 11-7 after five full frames. WHS sent 13 batters to the plate in the top of the sixth, which resulted in eight runs on six hits, five walks and a fielder’s choice. When the dust cleared, the guests were left with a sizable 19-7 lead. Mollie Maxon belted a three-run homer in the home half of the sixth, allowing Eastern to close back to within 19-10. Victoria VanMatre doubled home Hannah Billups in the seventh to complete the 10-run outcome. Wahama outhit the hosts by a 20-15 overall margin and also committed only two of the six errors in the contest. The Lady Eagles stranded seven runners on base, while the guests left six on the bags. Rose was the winning pitcher of record after allowing eight earned runs, 15 hits and two walks over seven innings while striking out three. Alexus Metheney suffered the loss after surrendering seven runs (two earned), seven hits and a walk over 4.1 frames while fanning two. Rose paced the Lady Falcons with four hits and five RBIs, followed by Billups and Emily VanMatre with three safeties apiece. King, Lauren Noble, Maddy VanMatre and Victoria VanMatre provided two hits apiece for the victors, while Miller and Emma Gibbs also added a safety each. Victoria VanMatre knocked in four RBIs, while Gibbs and King each drove in three runs. Maddy VanMatre also drove in two RBIs. Billups scored a team-best four runs and Rose also touched home plate three times. 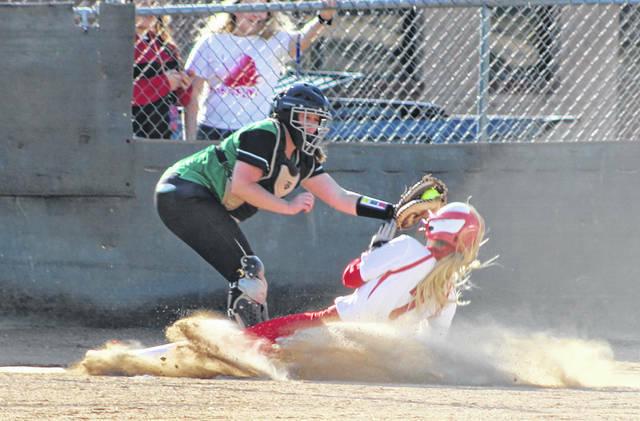 Cera Grueser paced Eastern with three hits, with Megan Maxson, Tessa Rockhold, Ally Barber and Kelsey Casto also provided two safeties apiece. Roberts, Mollie Maxon, Emmalea Durst and Baylee Haggy also provided a hit each in the setback. Mollie Maxon led EHS with three RBIs, with Megan Maxon and Tessa Rockhold also driving in two runs apiece. Kennadi Rockhold scored a team-high three runs, with Grueser also crossing home plate twice. Wahama returns to action Thursday when it welcomes Belpre for a TVC Hocking contest at 5 p.m.
Eastern returns to action Thursday when it travels to Stewart for a TVC Hocking contest against Federal Hocking at 5 p.m.